January 20: What’s in Your Bag? 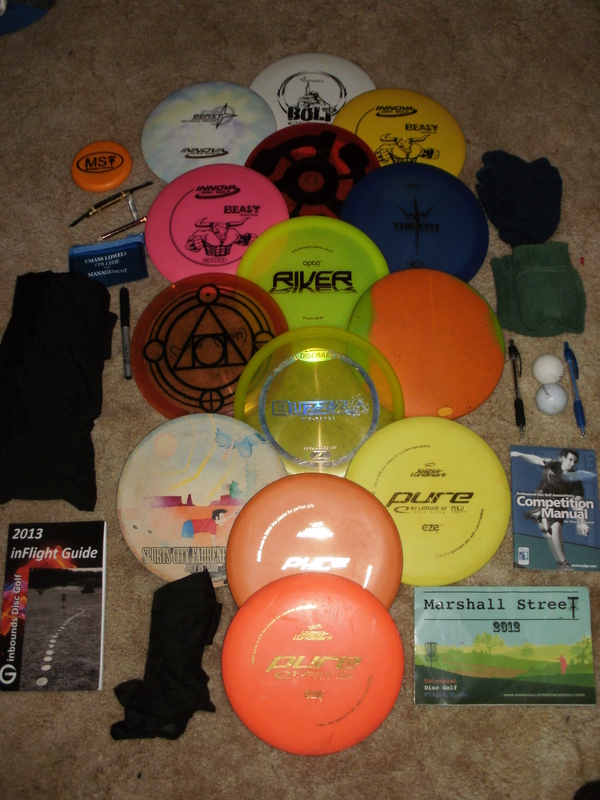 This edition of What’s in your bag comes from Josh Rogers, who calls Dacey Fields Disc Golf Course in Franklin, Mass., his home course. Rogers, of Bellingham, Mass., said he gets better each time he plays the par-62 course, a tightly wooded and low-option one. The tees are all natural as the course is still young. As for his bag, he uses a Bass Pro Shops Extreme Qualifier 360 Angler backpack. It’s not fully converted, but it holds a lot of items with minimal impact on his shoulders. The contents in the bag of Josh Rogers. November 25: What’s in Your Bag? This edition of What’s in your bag? comes to us from Ken Luckenbill, who hails from the Lehigh Valley in Pennsylvania and calls Jordan Creek Park in Whitehall his home course. The bag in question is actually a fishing backpack, converted into something for disc golf. This came, he says, after reading an article on Rattling Chains about do-it-yourself bags. And though that article noted not to use the Spiderwire bag, Luckenbill works at Dicks Sporting Goods and got a discount on the bag, so he opted to use it. That and it’s the only fishing backpack that Dicks carries. The work that went into the bag was extensive, but Luckenbill loved each moment. PVC pipes frame the bottom, flex PVC keeps the putter pocket upright, there are two mini pockets added to each side and elastic bands across the front keep the discs in. October 28: What’s in Your Bag? 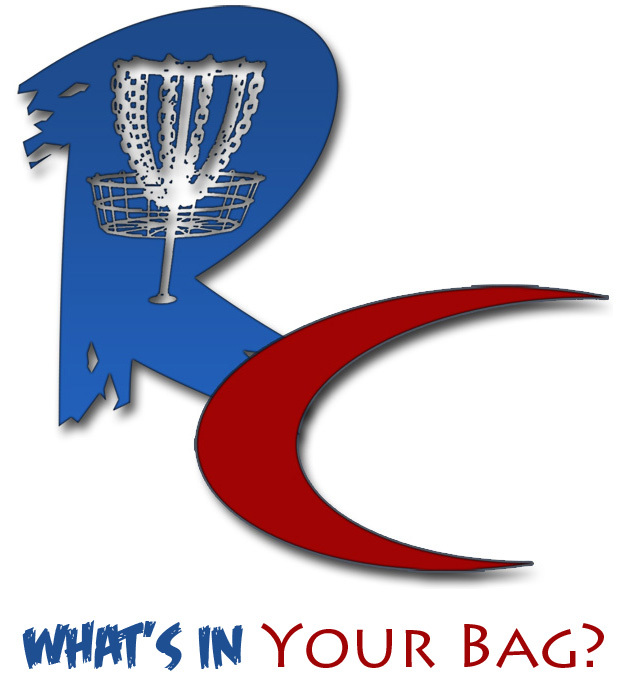 This week’s edition of What’s in Your Bag? comes to us from Sean Steele, who calls the windy and well-known courses of Emporia, Kansas home. After getting his start playing back in 1996 with some friends after football practice, Steele didn’t get overly serious about disc golf until 2010. “I instantly fell back in love with the sport, and since then have been playing almost daily rounds with a few tournaments this past year,” Steele said. Since returning to disc golf, Steele has seen the opening of major retailer Dynamic Discs offer him a wider selection than back when he started. Steele in particular gravitated toward much of the plastic originating from the Latitude 64 factory in Sweden, and the company and its subsidiaries now dominate his lineup. Sept. 30: What’s in your bag? 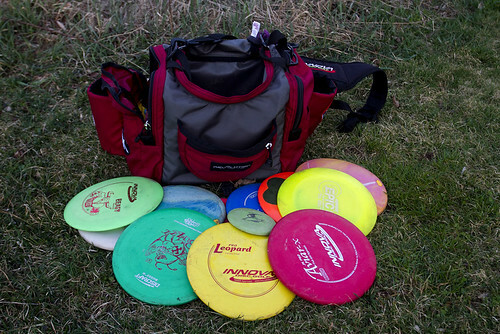 This edition of “What’s in your bag?” comes from Kris “Professor” Mickelson, who lives and manages a disc golf club in El Granada, Calif.
He’s played disc golf since 2010, and competed in the open division since 2010. Mickelson participates in the San Francisco Disc Golf Club weekly, which is held rain or shine each Sunday. He also co-wrote a feature-length film script based on disc golf and is the owner of Half Moon Bay Disc Golf. Besides disc golf, he also coaches little league baseball. As for the contents of his bag, there’s a bit of uniformity. See, he notes, that he’s been there when trying to find a yellow disc for 10 minutes, just to realize it’s in his bag and he should have been looking for a blue disc. So, Mickelson eliminated that by having all of his plastic custom stamped with a shield on them. He’s used the same person since 2005. 2- 36oz. 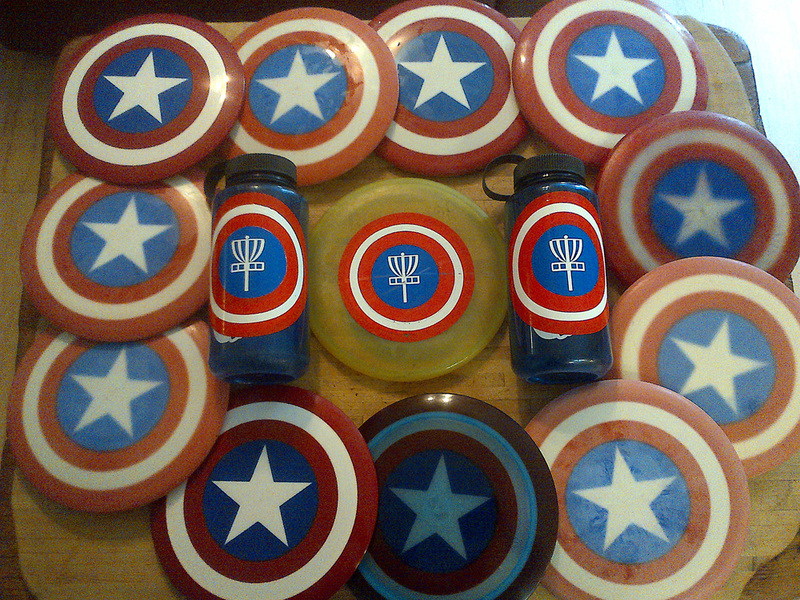 Blue Nalgene Bottles with the Half Moon Bay Disc Golf Club Logo on them. June 9: What’s in your bag? 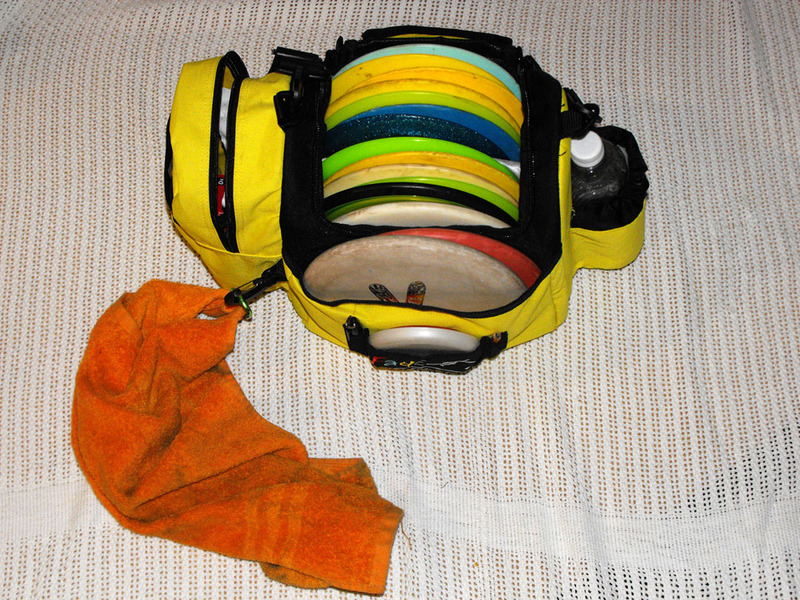 This week’s “What’s in your bag?” feature comes from Brian Buller, who calls Enterprise Community Park in Redding, Calif., his home course. And on a round, Buller doesn’t just carry his discs. He’ll make sure of a cheap cigar or two and he’ll never be seen without his Star Boss, the disc which got him his first ace — a forehand skip around a tree. Let’s check out the rest of Brian’s bag. 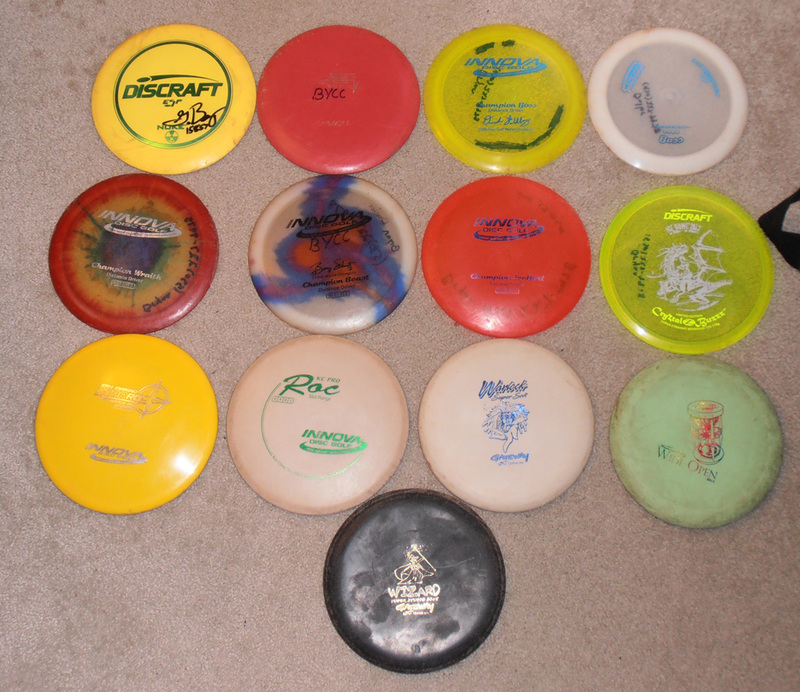 The discs Brian Buller carries. May 5: What’s in your bag? Kelly's bag carries a lot of things! But it’s not the courses that Kelly calls home that makes the bag unique. Nope. It’s that Kelly names every disc. 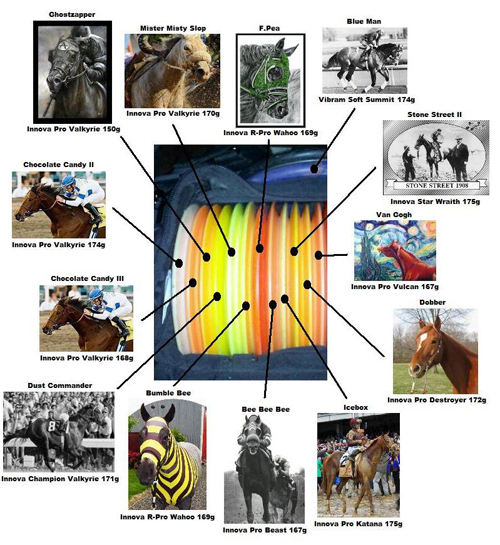 Not only are the discs named, they are after race horses! In fact, it’s a superstition. Kelly calls Optimist Park (Fort Morgan, Colo.); YMCA of the Rockies (Estes Park, Colo.) and Badlands (Federal Heights, Colo.) as home courses. Good stuff, Kelly. And thanks for sharing what’s in your Fade Fly or Die bag! The rest of the stable for another day! Usually three pounds of change (I scrounged up enough change to buy a disc once! April 21: What’s in your bag? 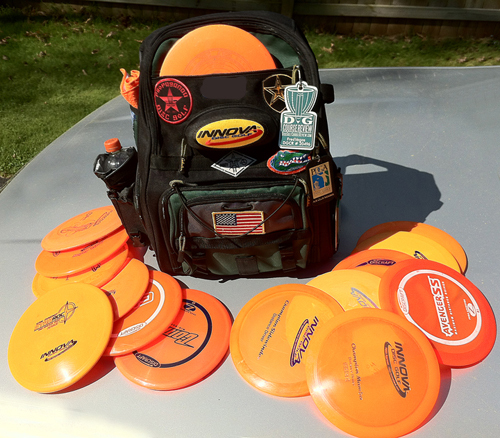 Kevin Morrow's bag, filled with his orange discs! This week’s What’s in your bag? 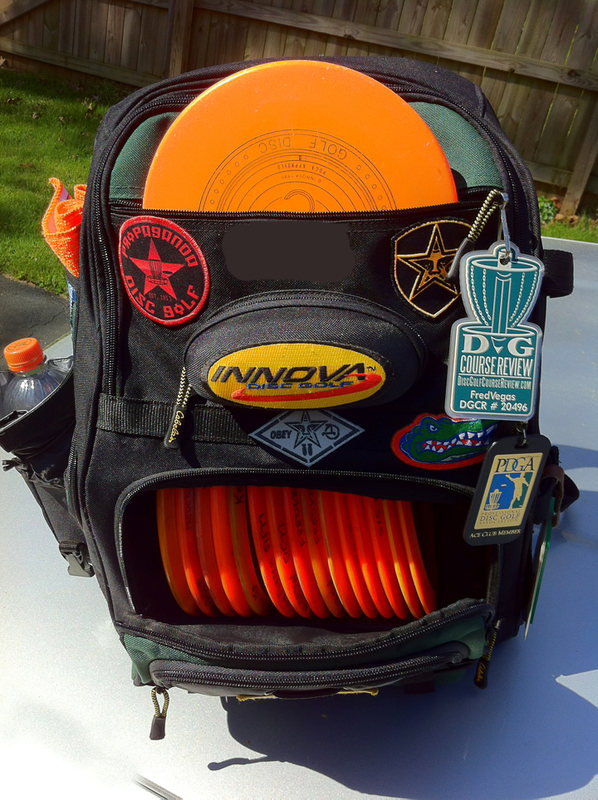 feature shows us the contents of Kevin Morrow, who keeps his discs easy to find with them all being orange. Morrow, of Fredericksburg,Va., calls Loriella DGC his home course. I began playing in 1986. Around 2002, I stopped playing and began playing again in 2010. So much had changed in those few years. First, I ended up cracking all my old DX plastic and needed to replace my discs. 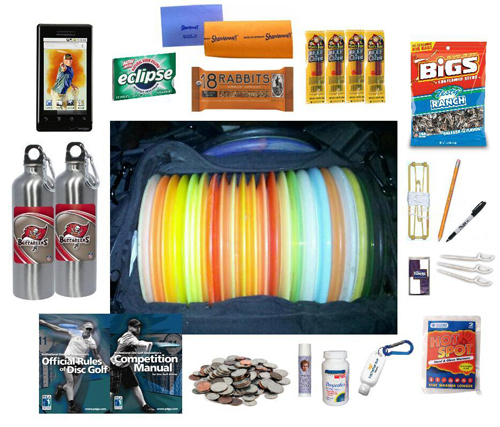 Then I went online and discovered all the disc golf sites and e-stores selling everything you could ever want. It’s not like the old days when you had to wait for the local pro to show up so you could buy your plastic out of his trunk. They still do that but now you go online and the latest plastic can be at your door the next day. So, I had to learn discs all over again and the different plastics. I have bought just about every mold and tried it out to see how it fit my throw. It is a little different than most. I got the idea from a member a DGCourseReview who found this backpack on Cabela’s website. It looked like a great option and I always wanted to find a backpack style that didn’t cost an arm and a leg. My bag is a Cabela’s XPG Pro Series angle tackle backpack. It lists for 69.99 but I was able to get it for the online sale price of 49.99, with free shipping. I had to make a few modifications. I built a half-inch PVC frame to keep the bottom compartment that held the tackle boxes rigid. With the frame, I can carry about 19 discs. Without the frame, even more can be stored. I only carry 14 discs. The top compartment has plenty of room for my extra stuff. I also drop an orange or some kind of snack, too. The top flat pocket, behind the sunglasses case, makes a great putter pocket that can carry two putters, but it can’t be zipped up with discs inside. So I put the putters in the top compartment when I’m traveling. I like personalizing my stuff. Most of the patches were given to me by friends and family. 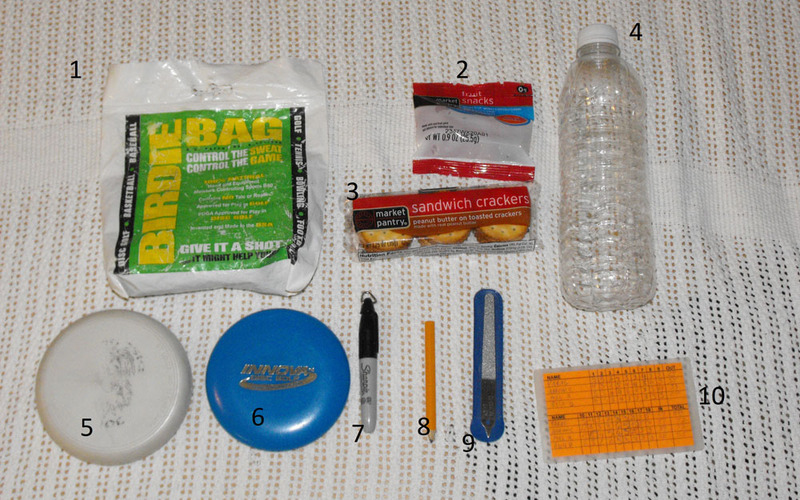 April 7: What’s in your bag? This week’s What’s in your bag? feature shows us the contents of Aaron Cronk, who starts with his banana-colored Fade Crunch and builds from there. Cronk, of Lutz, Fla., calls USF Riverfront (Tampa) his home course. He’s been playing for about a year. 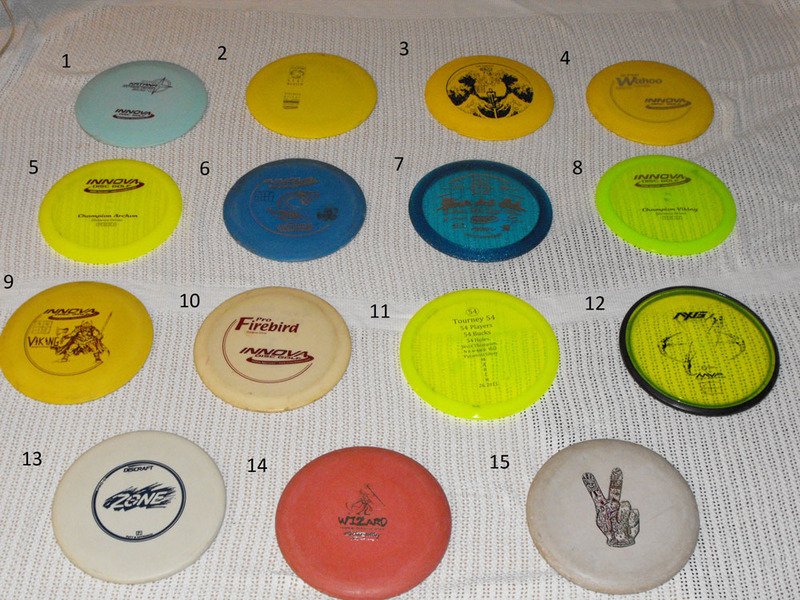 Discs 1-11 are drivers, 12 and 13 are mid-ranges, and 14 and 15 are my putters. 1. Innova Katana (Star): This is my top distance driver. I get more distance and more speed out of this than my other discs. This has also become my favorite roller disc for big distance. 2. Innova Wraith (Echo Star): Great for distance and skip shots. The wraith was the second driver I ever owned. 4. Innova Wahoo (R-Pro): Floats in water. This is an older disc that has been beaten in pretty good. It flips over real easy so if I throw it flat, it’ll go right. This is also one of my roller discs. 5. Innova Archon (Champion): This disc flies straight for me. If I put some anhyzer on it, it will fade back and land flat. 6. Innova Sidewinder (DX): This disc is beaten in to the point where if it’s thrown flat, it’ll fly to the right with little fade at the end. 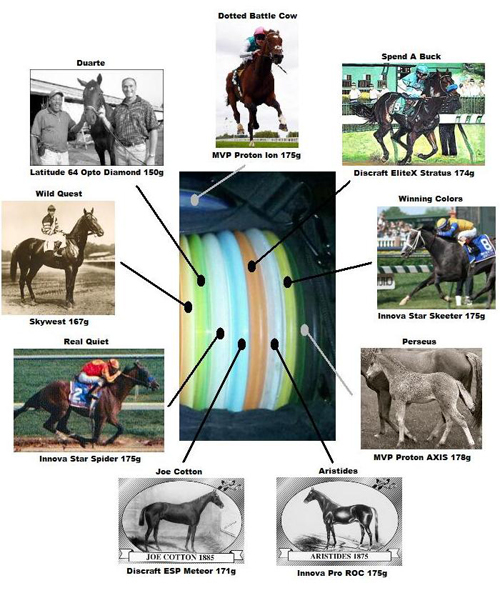 This is another one of my roller discs. When I want to throw a roller with less distance than my Katana, I’ll use this. 7. 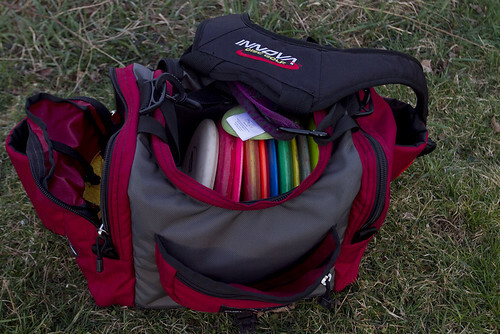 Innova Roadrunner (Champion): This is relatively new to my bag. I got it from the Tour del Sol Triple Crown Series at Pine Oaks in Ocala, Florida. I’ve used it for straight shots so far. Roadrunners are supposed to be great roller discs, but I still need to test it out. 8. 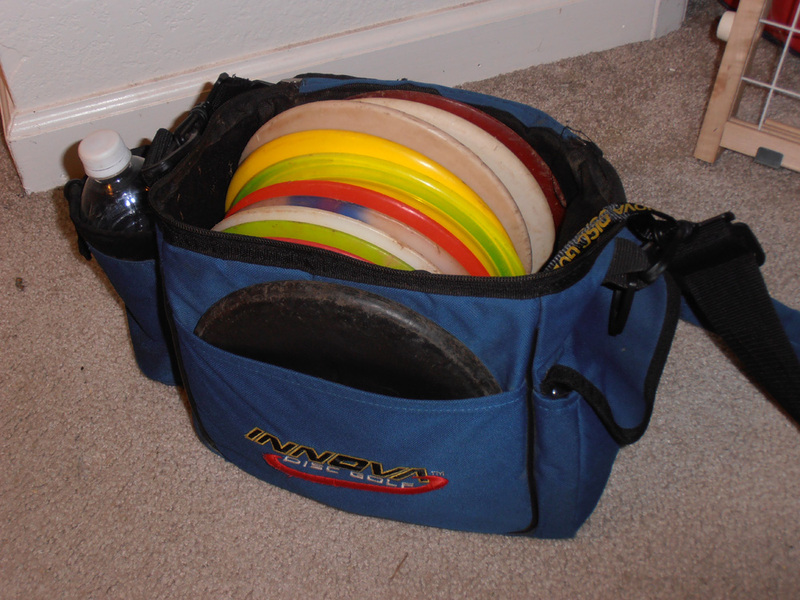 Innova Viking (Champion): The viking was the first disc I ever owned so it holds a special place in my bag. Needless to say, this is also one of my top discs. The Viking holds a great line with a nice fade at the end. It’s a slower driver so I use it when I need less distance. 9. Innova Viking (DX): This is another disc that is beaten in. When I need more high speed turn than my champion Viking, I’ll throw this flat and it will turn right for me. 10. Innova FL (Pro): This a Pro Plastic Firebird with less fade at the end. I like to use this mainly for tomahawk throws to get out of trouble. 11. Innova TL (Champion): Basically a TeeBird with less fade at the end. This feels better in my hand than a TeeBird, and I use it for straight shots. 12. MVP Axis (Proton): This is my straight flying mid-range. It’s similar to a Buzzz SS but seems to get a bit more glide on it. This is also good for turnover shots. 13. Discraft Zone (Pro D): I use this for an over-stable mid-range. It’s great in the wind. I like the Zone for short skip shots and flex shots. 14. Gateway Wizard (Super Stupid Soft): This is my back up putter if my putts are a bit off. I also use this for windier conditions. I like my putters to be on the heavier side and this is 175g. 15. Gateway Voodoo (Super Stupid Soft): This is my main putter. Out of all the putters I’ve tried, this feels the most comfortable. This weighs 174g. 1. Birdie Bag: Everyone should get one of these. Florida gets pretty humid and muggy so when my hands get sweaty, I bust this out. 2-3. Fruit snacks and peanut butter sandwich crackers: If I’m going to play more than one round, I like to throw snacks in my bag. 5. Gateway Dual Stash Mini: This is my main mini. It’s great to keep extra cash in it for handicap or to pay the occasional squid. 6. Innova Mini: This is my back up mini that I hope to never use (don’t want to lose that cash). It’s great to have in case a friend needs to borrow a mini though. 7. Sharpie Mini Marker: Fits in my bag better than a normal sized marker. You never know when you’ll buy a new disc or get that ace. 8. Pencil: just a standard golf pencil. I also carry a mechanical pencil as a backup. 9. Nail File: Sometimes I forget to cut my nails before I play. I used to carry clippers, but I would cut my nails too short and end up bleeding. If anyone had this happen to them, get a nail file. 10. Marshall Street Reusable Scorecard: Even though I use my cell phone and Easy ScoreCard Pro to record my rounds, this is a great backup. The cards are erasable so they’re great for handicap rounds. Also these are waterproof so they can handle bad weather. That’s what’s in Aaron Cronk’s bag. March 24: What’s in your bag? Note: This is the second of two weekly features we’ll be running at Rattling Chains. Both features — the Photo of the Week and What’s in your bag? — give readers the chance to submit to the site. Until we build up several of each of these, we’ll be swapping these every other week. Once we build a good amount of them, we’ll run one of each every Saturday. For the first week, I’m going to run what’s in my bag to show the items we are looking for. See the end of this post for information on submitting your bag and contents! We look forward to seeing what you have! Innova JK Aviar (175 — carry two). Usually two 32oz Nalgene bottles of water, but carry one per 18. My bag is a Revolution “Carolina” Team Bag with Innova gel straps. It’s the most comfortable pairing I’ve found to carry discs (and other items). The straps make the bag lighter, it seems. During tournaments, I’m more apt to make things as light as possible — so no camera etc. If it’s hotter, I’ll carry both water bottles as I tend to drink as much as possible when out playing. I hate getting to like hole 15 or 16 and feeling like I’m immensely dehydrated because I didn’t drink on a regular basis. So, two bottles per 18 becomes a must in the warmer months. I used to carry more discs — but realized I didn’t use them all. During tournaments, I take a few out as well so I’m not tempted to do something silly. This helps eliminate a little weight so I can carry both water bottles etc. That’s what’s in my bag.